Juan Rulfo (1917-1986) was one of Mexico’s premier authors of the twentieth century and an important precursor of “magical realism” in Latin American writing. 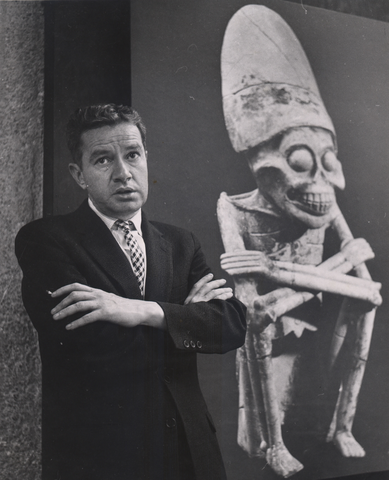 Rulfo has been credited with influencing the work of several generations of Latin American writers, including Sergio Pitol and Gabriel García Márquez. He is well known for his novel, Pedro Páramo, and short story collection, The Burning Plain (El llano en llamas). Deep Vellum’s forthcoming publication of The Golden Cockerel & Other Writings introduces his cinematic novella, originally made into an award-winning film, into English for the first time, along with a collection of rare, previously untranslated writings. Rulfo received Mexico’s National Prize for Literature (Premio Nacional de Literatura) in 1970, was elected to the Mexican Academy of Language (Academia Mexicana de la Lengua) in 1980, and received the Cervantes Prize (Premio Cervantes), the highest literary award in Spanish, in 1985. Rulfo suffered from lung cancer in his final months and died on January 7, 1986 at his home in Mexico City.